3102 Sea Crest~ Oceanfront Villa with Beach and Pool Views, Across from Coligny! 3102 SEA CREST - 2 BEDROOM DIRECT OCEANFRONT VILLA WITH TONS OF AMENITITES. 3102 Sea Crest is a tastefully decorated 2 bedroom/2 bath villa with oceanfront views from the living area and second bedroom balconies. Located on the first floor, this Sea Crest rental provides the atmosphere and amenities many guests come to Hilton Head Island for. As you walk into the entry foyer, to the right is the Master bedroom with a King bed and a 26” flat panel TV. There is a bathroom with separate shower, soaking tub and double sinks that is shared with the hallway and main living area. Straight ahead from the foyer is the spacious living area which features magnificent views of the Atlantic Ocean and easy access to the large, private balcony overlooking the pool area and beach. There is a Queen sleeper sofa and a 32 inch flat panel TV. The open floor plan makes this whole space bright, open and comfortable. The fully equipped kitchen features plenty of counter space and a breakfast bar that has seating for 2. Close by is the oval dining table with seating for 6. Guests will enjoy the convenience of having a full sized washer and dryer which is located just down the hallway from the entrance. Just off the foyer to the left, is the Guest bedroom with 2 Queen beds, a 26” flat panel TV, and a private bathroom that has a separate shower, soaking tub and double sinks. There is also a private oceanfront balcony. The Sea Crest Resort offers amenities such as two oceanfront pools, hot tub, children's pool, fitness center, therapy pool and a restaurant on-site. Just across the street is Coligny Plaza which has over 60 local shops, restaurants...and even a grocery store. 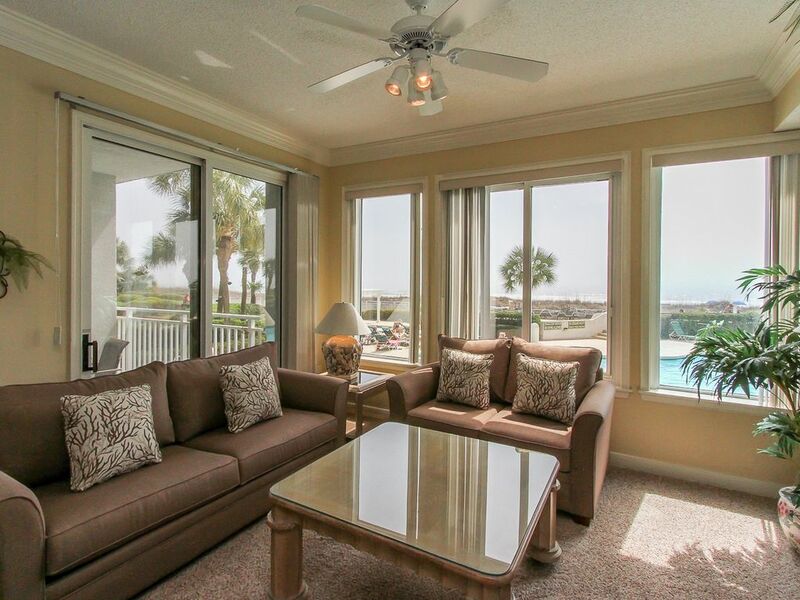 3102 Sea Crest will truly provide you a great Hilton Head Island vacation experience.